(Verso) lower right, in pencil: "Graciela Iturbide"
(Verso) lower left, in pencil, in the artist's hand: " 'La frontera' tijuana. Mex/ 1990"
I think all photographers make documentary photography, but, afterwards, it all comes down to how each person interprets what they see, whether it has more or less poetry or imagination. A faceless man exposes a massive tattoo of the Virgin Mary on his back. The dusty landscape seems devoid of any activity or importance, but in fact is the politically fraught Mexican-US border. 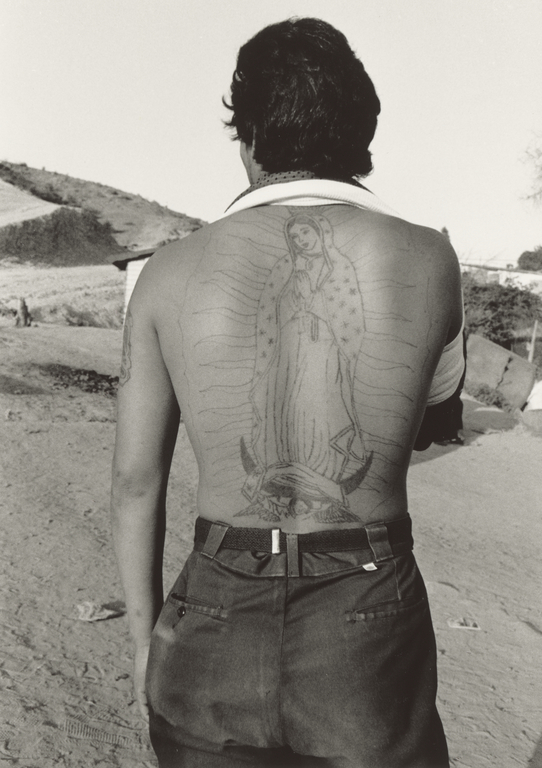 Graciela Iturbide's photographs capture nuances of cultural identity. Even the tattoo is a highly coded element; it depicts Mexico's patron saint, the Virgin of Guadalupe--also called La Virgen Morena, or the brown-skinned Virgin. Some speculate that Mexico's indigenous Virgin of Guadalupe has roots in the Aztec mother goddess Tonantzin. The characteristic wavy, pointed tendrils that surround her evoke rays of holy light. However, these are also thought to refer to something organic, namely the spiked agave plant, which Mexicans ferment into pulque, mezcal, and tequila--alcoholic beverages enjoyed on the Virgin of Guadalupe's feast day. Like her mentor, Manuel Alvarez Bravo, Iturbide is known for photographs that explore the diversity of her native Mexico, especially its indigenous peoples. In this particular image, Virgin of Guadalupe's likeness might function as a symbol of pride, identity, or even as a protective talisman in a difficult world. Iturbide, Graciela. Images of the Spirit (New York: Aperture Foundation, 1996), p. 88, ill.